What a wet and windy week we have had, leading to two date changes for our Bockett’s Farm trip; fingers crossed for a dry day next Tuesday! Our seeds are growing really well and are ready to take home and pot up. We have discussed the country code and the children were able to talk about ways to behave on a walk and why. Hopefully they will be able to remind their families on their next countryside walk what to do! 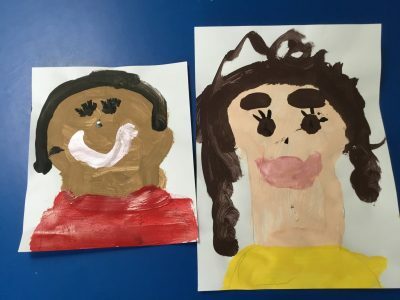 In art we have been finishing off painting our Mother’s Day pictures which are looking beautiful! There was much discussion about favourite colours, features and skin tones, so do keep an eye out for yourselves on the chapel wall! We continue our farm topic, learning about the farm animals and their babies this week. Please keep bringing in your recycling e.g. cereal boxes and yoghurt pots as the children have started to create their 3D model of a farm.